This is a very high-level competition. Of the 5 matches, there is none that we can say we will win for sure. Its hard to predict the outcome, but I know that this will be an exciting match. Kim Taek Soo is a Korean veteran, and we have played each other many times. I have a higher winning percentage, but after the change to the big ball, we have only met once: he beat me in Osaka. Kims style is fast and furious, and difficult to play against. It will come down to execution on the court. About a 50-50 match. The Chinese team is the worlds dream team. They have 5 very strong players, but we are a strong team, too. This is no doubt an exciting and fierce contest. My teammates and I have the confidence to win. Saive and Boll have the better odds, and my match against Kong is key. We have faced each other so many times. He is a grand slam winner, and the worlds best player. 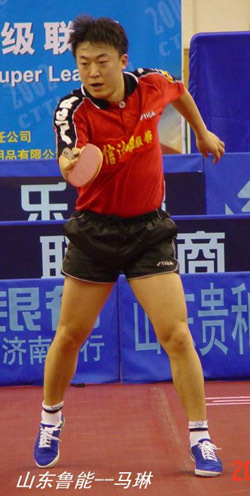 Overall he beat me more than I have beat him, but I have won the important matches, such as the Atlanta Olympics and the Asian Games. When he played me, at the critical points he would appear a little nervous. Perhaps he had greater pressure to win. I have confidence in myself, and I will play my best to win. I am very happy to represent China in this match. Thanks to the Kemp Corporation for their support. I have played Samsonov many times, and overall he had the better record. At the 1997 Worlds, I lost to him 0-3. At the 1999 Worlds, I beat him 3-1. The last time we met was in the 2000 Brazil Open, and I lost then. After the change to the bigger ball, we have not played each other. He is playing less internationally now, and I am not sure about his condition. He has solid fundamentals, all-round skills, but I will do my best to win. As for the other match-ups, they are very even , other than Liu Guoliang having the upper hand against Saive. Back in July I first heard of the "Kemp China-International Challenge Match" to be held in Wuhan. First I would like to thank the Kemp Corporation for providing us this great opportunity. I will face Waldner. Although the media said that I am favored to win, I feel a great deal of pressure. Waldner is getting a little old, but he has so much experience. He is especially tough in important matches, and the greater the prize money the better he plays. He does well in Olympics and other big tournaments, and that shows that he is a great game player. I have played him about 4 times, and we are even in results. The last time I beat him in a challenge match in Jinan. This time I will be well-prepared. The other match-ups are all very close, and it will come down to the actual performance on the court. I believe this will be a very evenly-matched competition, and every one of the matches will be tightly contested. But I believe we have a very strong team, and I have confidence in myself and in my teammates. For us, this will be a rare and special experience. There were some Chines media reports of me retiring after this competition. Please dont believe in those rumors. I am ranked number 7 in the world, and I plan to play in the Pro-Tours Grand Finals in Sweden this year. I also plan in play in next years Worlds. The 2002 World is tentatively scheduled to be held on October 31 through November 3 in Suzhou city, Jiangsu province, China. 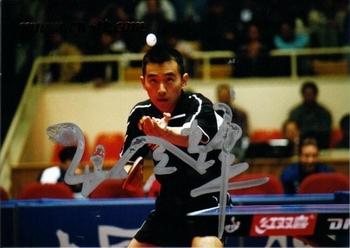 Wang Liqin and Samsonov will have another chance to face each other. Boll and Schalger are some of the top players invited to compete.